Dude. I had no idea that the fierce need to be the “cool mom” was going to strike me so early. 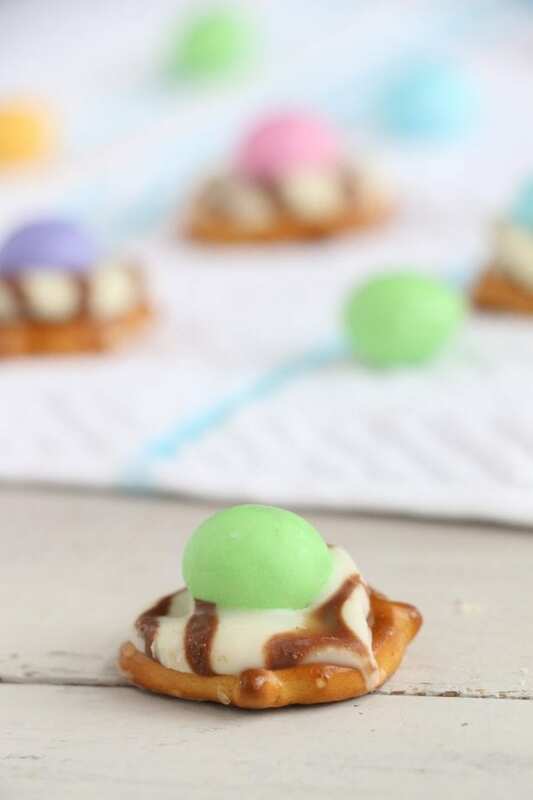 My kids aren’t even in school yet–they’re still both preschoolers–and they already have me running around making cute treats like these Sweet Spring Pretzel Bites just so I get that smile from them. Little sh*ts have me wrapped right around their little fingers, don’t they?! But it’s kind of worth it. See, not only do I get to be the cool mom, but I also get to gnosh on these snacks, too. That’s a win-win if I ever heard one. 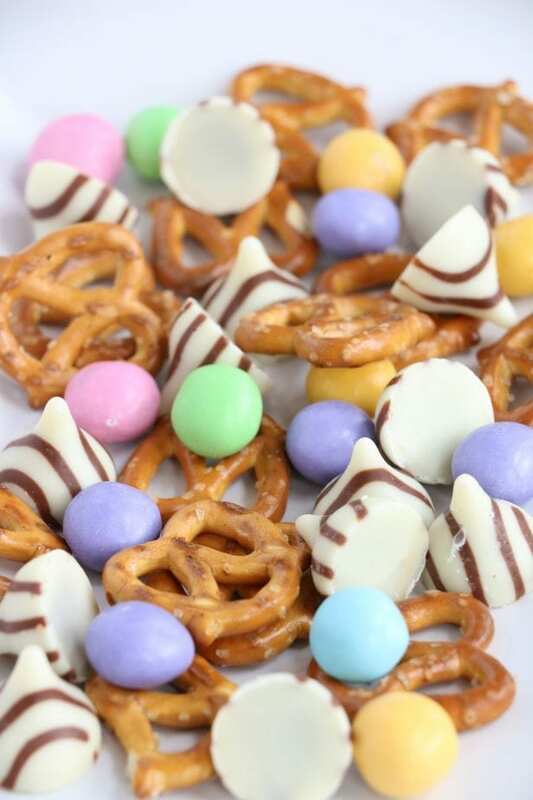 These are the most ridiculously easy snacks ever to put together on the planet. 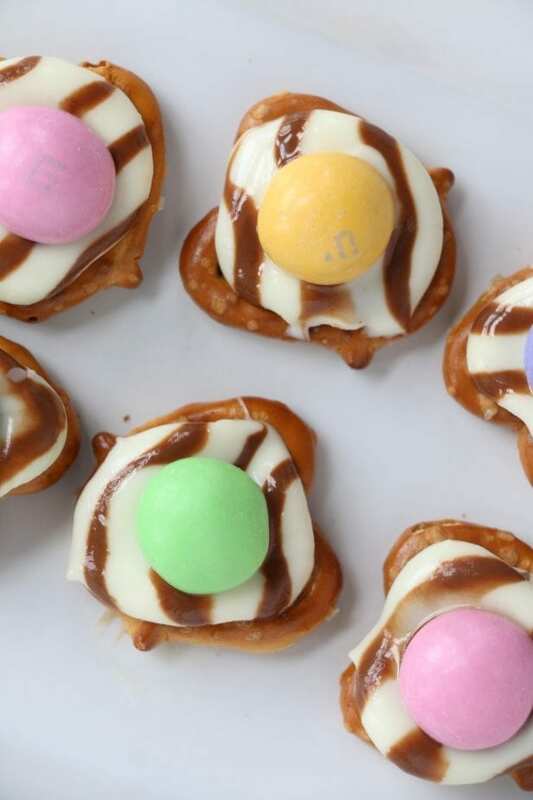 They’re just 3 ingredients–pretzels, Kisses, and M&M’s. 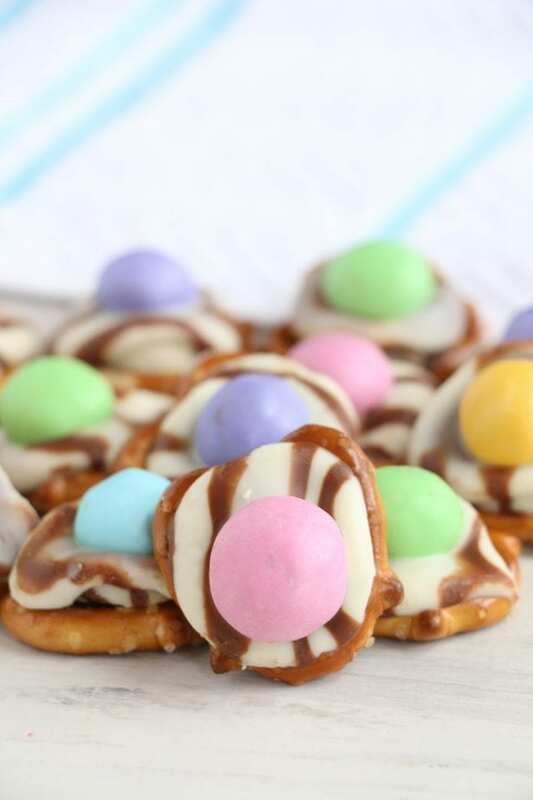 Just set a pretzel down, plop a Hershey’s Kiss on top (the hug ones because they’re just so cute–and yummy), then toss it in the microwave for a few seconds. 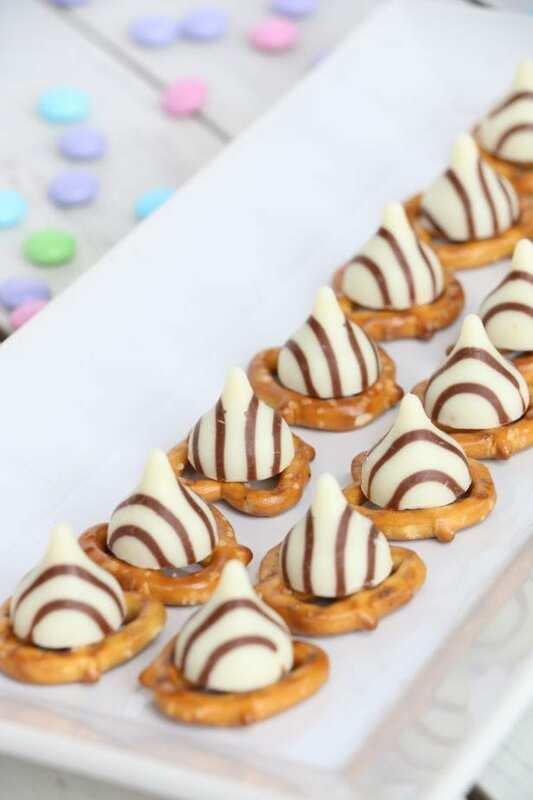 I actually recommend doing the whole microwave thing with multiple pretzel/Kisses at a time–because doing this whole process one-by-one would be silly and time consuming. Which would be the opposite of a win. 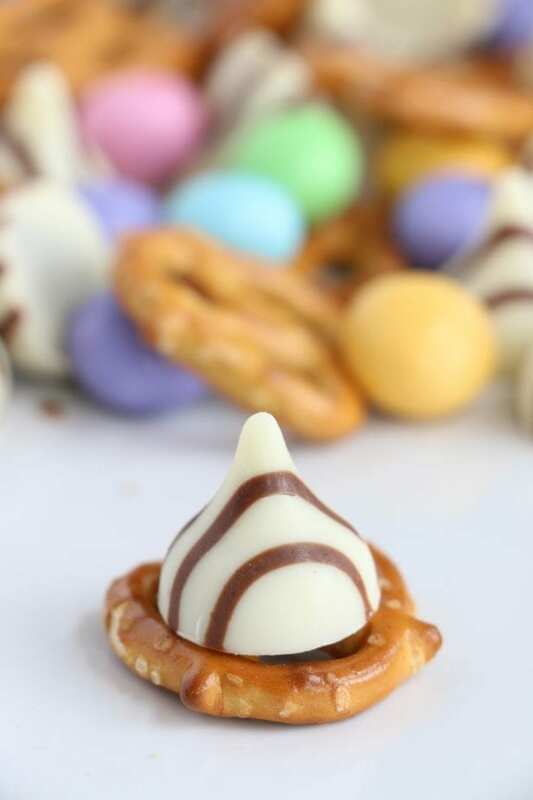 When the Hershey’s Kiss gets all good and melty on top of the pretzel, that’s when it’s time for you to STRIKE! Throw down an M&M (the pastel ones, please, because we’re being springy here) on top of each Kiss, giving it a little mush to bring them together. 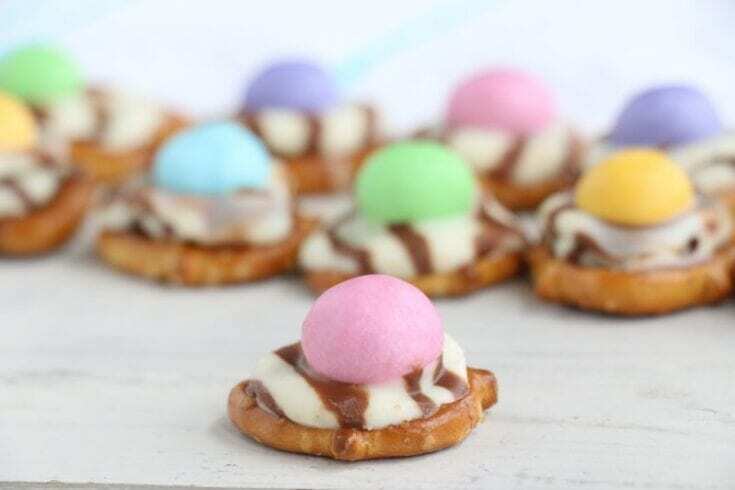 You can totally do them in all the colors randomly–or, if you’re like me, you’ll do 10 green, 10 purple, 10 pink, and 10 blue, leaving the yellow ones out and having to make a whole ‘nother batch because you were being weird. But, the important thing is that they got done. And now I have an amazing snack to take to the park tomorrow with the kids for our playdate/party/why do I always invite like 10 people to a playdate?! Seriously, can anyone answer that for me? Why do I always invite way more people to a playdate than absolutely necessary? Oh, I am a mess now. 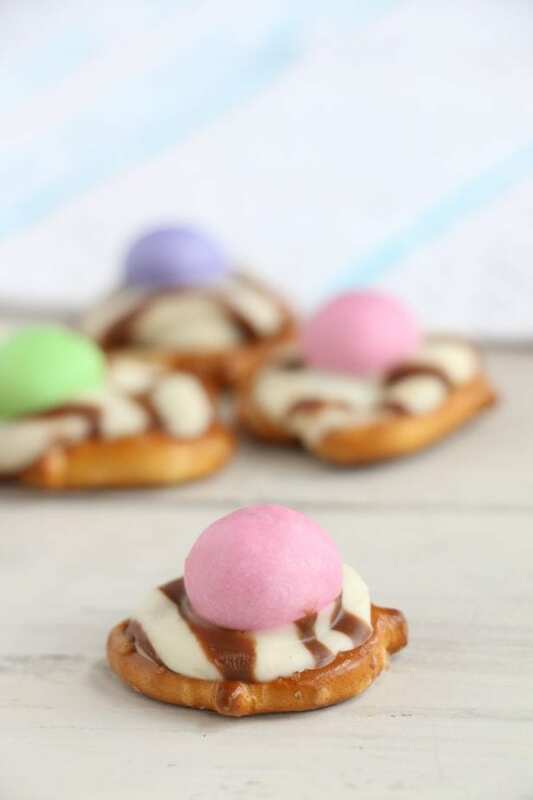 Not only are my kids getting me to make cutesy Sweet Spring Pretzel Bites, but I’m inviting ALL of their friends for playdates on the same day like a freaking party planner. These two kids really have me ‘whipped. LOL! 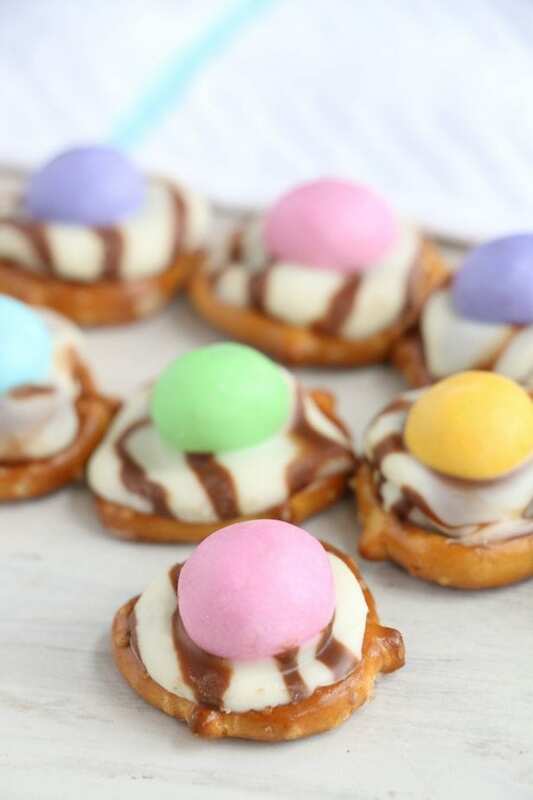 If you love these Sweet Spring Pretzel Bites, but you’ve run all out of pretzels (or you just have rods, oh no! ), don’t worry! Just pin this recipe to your favorite spring snack ideas board and it’ll be here when you’re ready. 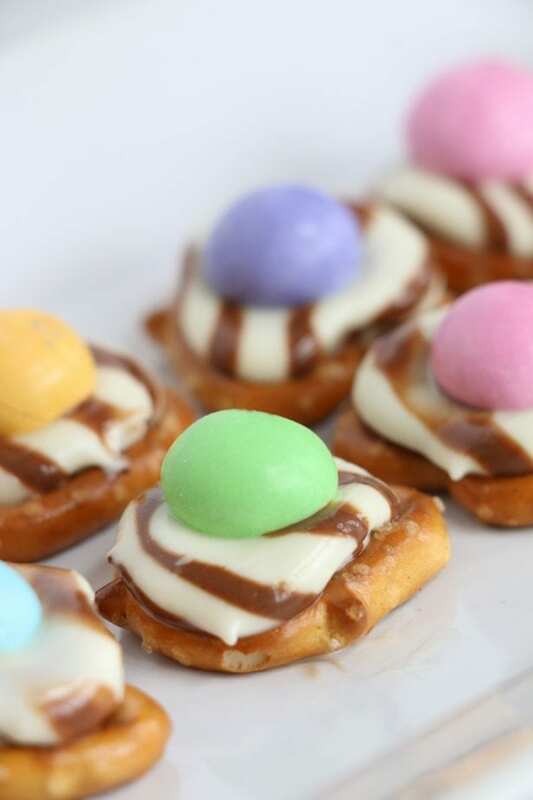 Oh, and if you make these yummy Sweet Spring Pretzel Bites and love ’em, be sure to drop us a 5-star rating on the recipe. That way we know you want more deliciousness like this! 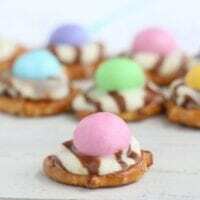 Spring is just the funnest time play with pastels and enjoy a snack at the park. 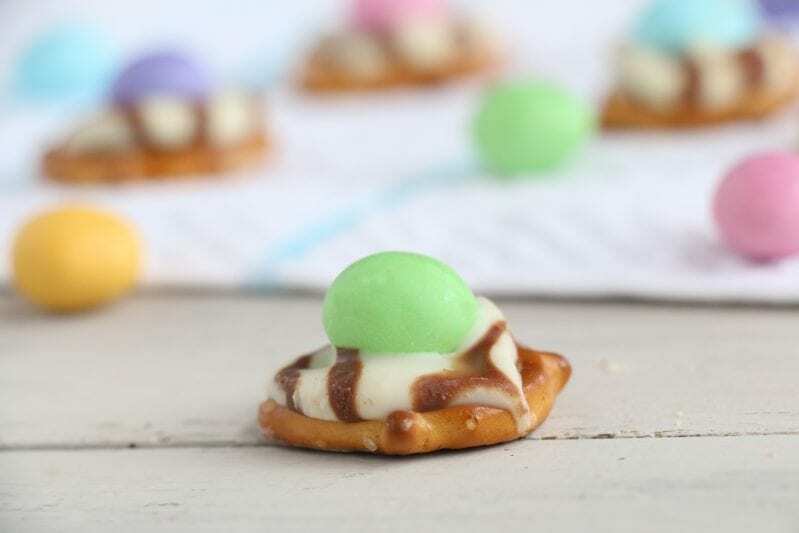 That's what these Sweet Spring Pretzel Bites bring to the party. Evenly spread pretzels out on a microwavable plate. Microwave in 30-second intervals until Hugs are softened. Gently push M&Ms onto the melted Hugs.